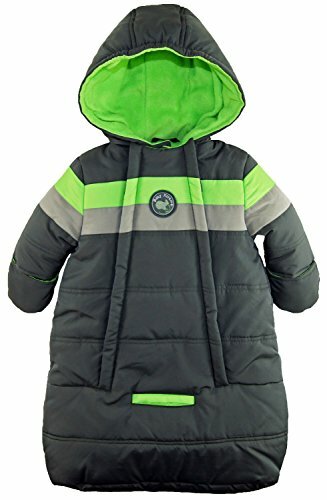 Microfiber color block with chest stripes print car bag snowsuit. Polar fleece lined. Built in elastic in the hood for better fit. Double side zip opening for easy on and off. Attached mittens. Seat belt hole for easy travel. Water and wind resistant. Perfect accessory for cold days. Chest stripes. Polar fleece lined. Attached mittens. Built in elastic in the hood for better fit. Seat belt hole for easy travel. Fully Insulated for extra warmth. Water and wind resistant. Double side zip opening for easy on and off. Perfect accessory for cold days.